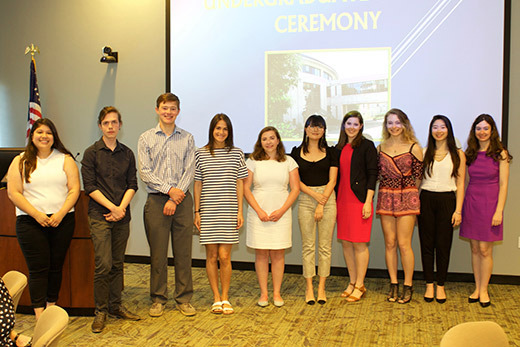 Undergraduate research award winners include, from left, Jackie Veliz, Chris Batterman, Sam Galloway, Liza Gellerman, Nora Sullivan, Allison Lin, Catherine MacGregor, Hannah Christianson, Claudia Tung, and Zola Berger-Schmitz. They were honored at a reception May 7. Photo courtesy Emory LITS. Fifteen Emory students received Undergraduate Research Awards from the Robert W. Woodruff Library and the Stuart A. Rose Manuscript, Archives and Rare Book Library for research they conducted in the Emory Libraries, or will travel to conduct at another library. The students were honored at a brunch and awards ceremony at the end of the spring semester. The Woodruff Library’s Elizabeth Long Atwood Undergraduate Research Award recognizes Emory College undergraduate students in all disciplines who use the Woodruff Library’s collections and research resources in their original papers, digital projects or posters and show evidence of critical analysis in their research skills (such as locating, selecting, evaluating and synthesizing information). The Bradley Currey Jr. Seminar Award is open to undergraduates in all years of the honors program in the Emory College of Arts and Sciences, or any upper level student who is conducting original research. Successful applicants attend two intensive instructional workshops that train them to locate archival repositories, assess manuscript and special collections, plan their research and properly handle rare materials. Students who successfully complete the training receive grants intended to help defray the costs of conducting original research in an archival repository. The Alan Rackoff Prize was established through the Betsy and Wayne Rackoff Fund and named in honor of Rackoff’s late brother, an Emory student in the class of 1973. Wayne Rackoff 75C, vice president of clinical oncology at Janssen Research & Development, was among the first generation of Emory students in English courses to have access to primary materials in what was then known as Special Collections (now the Rose Library). The experience made a lasting imprint on his intellectual life and led him to become a longtime supporter of the archival collections. The prize is awarded to students for the best papers, projects or honors theses written on the basis of primary source material related to a class or course of study in any academic department except the Department of English. Patsy Collins, class of 2019, dance and business double major, winner for her work and choreography, “Disinterested Cruelty,” informed by her research on the Rose Library’s Beats-related collections. Samuel Galloway, class of 2020, business major, winner for his paper “Welwyn Garden City: A Green Solution for Interwar Housing,” which drew heavily from the Rose Library’s Charles Palmer papers. The Schuchard Prize was established through the Betsy and Wayne Rackoff Fund and named in honor of Wayne Rackoff’s archival mentor, Ronald Schuchard, Goodrich C. White Professor Emeritus of English. The Schuchard Prize is awarded to students for the best papers, projects or honors theses created on the basis of primary source material related to a class or course of study in the Department of English only.